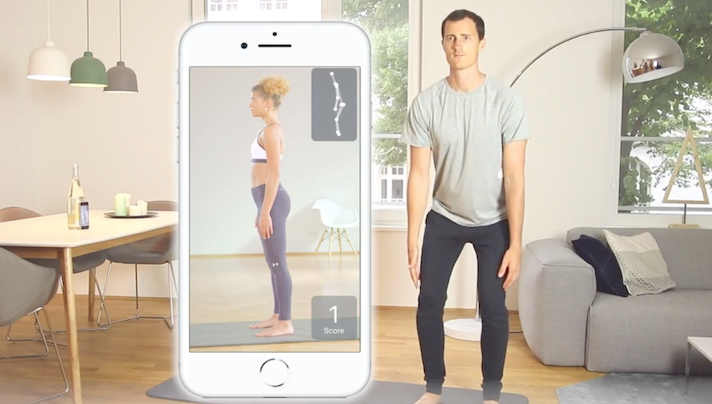 This morning Munich, Germany-based Kaia Health announced that it has launched an AI-powered motion tracking technology called the Perfect Squat Challenge app. The idea is that the app will work as a personal trainer and give users real-time feedback on the form of their squats. "Breakthroughs in AI-powered motion tracking and correction technology means that everyone now has access to a virtual personal trainer and physiotherapist on their iPhone — and can perfect exercises such as the squat,” Maximilian Strobel, head of Kaia Health’s AI Lab, said in a statement. “In the future, this technology will integrate within our medical device apps for diseases and conditions such as back pain creating a scalable, cost-effective therapeutic tool. This democratizes access to high-quality, bespoke fitness, rehabilitation and physiotherapy — and could reduce the burden on health services." Users start out by putting their smartphone upright either on a table or against a wall. They then have to move about seven feet away from the screen. When users open the app they are led by a virtual personal trainer, also named Kaia, who talks them through their squat exercises. Via the smartphone’s camera stream, the app tracks 16 points on the user’s body. People can then look at their pose versus the ideal pose for the exercise and adjust accordingly. As the user continues the exercises, Kaia also provides audio feedback and video instructions to the user. The technology can also connect users to other people on the app as a sort of online support community. While Kaia is looking at squats right now, later this year the company expects the platform technology to integrate with medical device apps that the company already provides, including one for back pain relief and another for COPD. There are plenty of fitness apps out there. Most recently Aaptiv, an on-demand fitness content creator, raised $22 million in funding. The platform offers an app that helps users choose from a library of audio training sessions based on their needs. Also in the space is wearable giant Fitbit, which released its coaching app on Microsoft’s Xbox One video game console and other Windows 10 PCs in January. Correction: This article has been updated to accurately reflect that the company is based in Munich Germany.